Las Vegas is one of the best places to go for entertainment on the west coast of the United States. Sporting a wide variety of Las Vegas hotels and casinos, nightclubs, restaurants and other things to do in Las Vegas, you will be able to find a little bit of something for everyone. 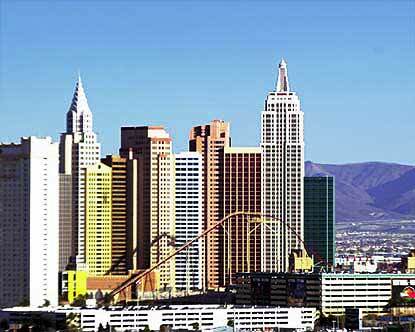 This site is dedicated to giving you information on booking a room in a Las Vegas Hotel. When you visit Las Vegas, you will want to plan your trip so you can experience at least a little bit of everything. Your first step is to pick the hotel and casino that you would like to stay at. Being on the Strip is the best place to be right in the action all of the time, although there are a variety of beautiful hotels and casinos off of the Strip as well. There are 113 hotels currently in the Las Vegas area. On the Vegas Strip itself, there are approximately 38 large hotels for you to choose from. Most of these include at least 1,000 rooms. A few of the popular hotels for accomodations on the Strip include the Mirage, the Venetian, the Bellagio, the Hard Rock, the Sahara, Paris Las Vegas, Caesars Palace and Mandalay Bay. Off the Strip, you will find luxurious hotels like Green Valley Ranch and the Fairfield Grand Desert Resort. In many of the hotels, you will find casinos to enjoy exciting evenings in. Some of the most popular casinos include the one at Caesars Palace Casino, the Hard Rock Casino and the casino at the Venetian. When looking for social based entertainment in Las Vegas, the nightclubs are the first place you should look. Ranging from wild parties at the Coyote Ugly in the New York New York to sophisticated evenings of wine and champagne at the Risque, there is a club to suit everyones desires and tastes. If you intend on being in Las Vegas over the holidays, such as around New Years, you will want to arrange in advance for reservations, as these clubs become the soul of the party in Vegas. Most hotels and casinos have at least one club within them. Perhaps one of the most enjoyable aspects of Vegas is experiencing the various restaurants located on and off of the Strip. Every hotel tends to have a variety of different restaurants. The Venetian, as an example, has world class restaurants like the Delmonico Steakhouse and the Royal Star. The Bellagio sports the Le Cirque and Michael Mina. The Mandalay Bay has the House of Blues and the Chocolate Swan. There are also many buffets and good deals to be found, which makes the strip a surprisingly affordable place to eat if you take the time to have a look. There are many attractions in Las Vegas to attract visitors to the Strip. Among them include seeing the world's largest gold nugget at the Golden Nugget, the Cirque du Soleil at New York New York, the Bellagio, the Cher Las Vegas show, the MGM Grand and Treasure Island. There are many other shows and events, such as the Fremont show every night, the Volcano eruptions at the Mirage, and the fountain displays at the Bellagio that are free of charge for any who want to see it. With this much to see and do, there is never a dull moment when visting Las Vegas Hotels.